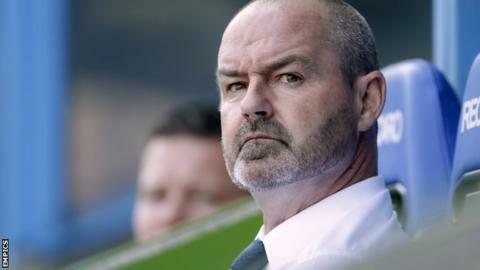 Reading manager Steve Clarke believes there are positives from his side's early performances despite a lack of home league goals so far this season. The Royals were held to a second goalless draw at home in succession against MK Dons on Saturday. Clarke's side have also failed to score in a home game since 4 April. "I can't handle the people who want to focus on the negative. There has to be more positive and this is a good team, who have a chance," Clarke said. "This season is a different team, a different group. We haven't scored many goals, but in every game we have bossed it from start to finish," the former West Brom manager added. "What I'll tell my players is if they continue like this, they will finish in the top half of the table. No doubt. "Football is a strange game. But, if you keep doing the right things at the right times and you keep the right habits and don't concede silly goals, eventually you will start to win matches." Clarke responded to rumours linking Reading with a loan move for Watford striker Matej Vydra, admitting it would be hard to tempt him away from Vicarage Road. "I know he wants to play in the Premier League, so I would think it would be a difficult one," replied Clarke, having worked with the 23-year-old while at West Brom. "I'm sure we'll be linked with every striker that's available and realistic for us."